The Family of Rotary – In pursuing the first Object of Rotary, we seek “to encourage and foster the development of acquaintance as an opportunity for service.” Friendship and fellowship was the foundation, the bedrock on which Rotary service was built. 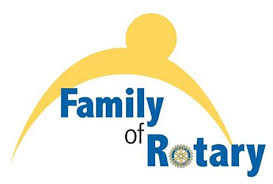 Why is “Family” a focus of the Elizabethtown Rotary Club? Because Rotary is about community. The community we live in, the worldwide community and the community of Rotarians. When we share in community, your problems become my problems and your joys – my joys. Therefore, Rotary families matter to Rotary, the family of Rotarians and the Rotarian’s family. If we are to live out the Rotary ideal, to create a better world, we must start with the family. We need to care for all the members of our Rotary family, because without each other there is no community. Because we want to increase Rotarian satisfaction, improve retention, involve more people in Rotary events, make service projects more successful, and have greater support for International projects, we place emphasis on family!